A Japanese dry river bed is a waterless landscaping feature that is widely used to add an interesting focal point in a garden. They are popular in arid regions such as the Southwest that experience limited rainfall at certain times of the year, and are becoming en vogue with conservationists. 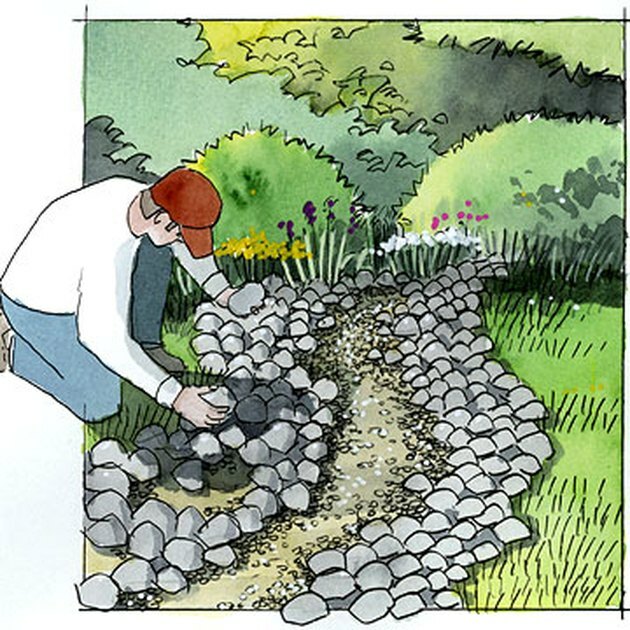 Dry river beds are low maintenance and can offer some help in reducing undesired flooding of garden plots by providing an additional area for water runoff to collect. Decide how long and what shape your dry river bed will be and remove up to 16 inches of soil from the area with a shovel. Use a soil compactor or landscaping tamper to compress the soil and to create at least a 45 degree angle on each side of the trench. Secure landscaping fabric along the length of the trench and along the sides to discourage future plant growth in the space. Shovel in a layer of small gravel 1/2 inch thick into the opening and along the sides as a base for the river bed. Place moderately sized (3 to 9 inches long) river stones along the sides of the trench tightly together, keeping in mind that you wish to maintain a natural look. These rocks can be secured with cement for greater stability. Add larger stones such as flagstone to the flat area bordering the trench, or have three or more stones supporting a small, rustic bridge over the dry river bed to finish your project.